I have been made aware of a suite of IoT eBooks + some on robotics (24 books in total) which are currently on special ($15 US) at the Humble Bundle store for the next 2 weeks. Will this be the way of the future for major roads and infrastructure projects? Not to push any 3rd party product, but in conjunction to JIRA Atlassian also has a collaboration tool called Confluence. Regarding project estimation, e.g. time and budget, where do you start if you were as a new start-up engineer and don’t have that past experience in the area to make a reasonable judgement/estimate? One of the great challenges in designing an IoT device is working out the system's battery capacity and determining the amount of Energy your IoT device will require to meet its useful life before it need to be replaced or recharged. So here is a link to a free online Battery Life Calculator for IoT Applications provided by Element14 (formally Farnell). This page also raises some good points, which as a designer you should be able to answer or have defined in the system/design requirement specification. Pirelli's smart tires - what's next? Thank you all for feedback and input on this thread, it is simply amazing the diversity and creative solutions one can come up with when we can collect and process lots of data/information. Which is perhaps well beyond the "marketing team's" strategic plan to sell more tyres, i.e. the novelty factor and first to market with an internet enable tyre. However the collection and the combining of various data source is a double edge sword and a means to de-identify will play an important role for IoT. e.g. the classic example is personal health information and insurance companies. And following on my other point about marketing and novelty, I must admit I had a little chuckle when I saw in this Month's (Mar-2017) IEEE's Spectrum a comment about a 1960's Goodyear advert for "translucent tires." see file attached. FYI - I see that Channel 7's program "Australia Beyond 2020" touched on the topic of smart cities last episode. 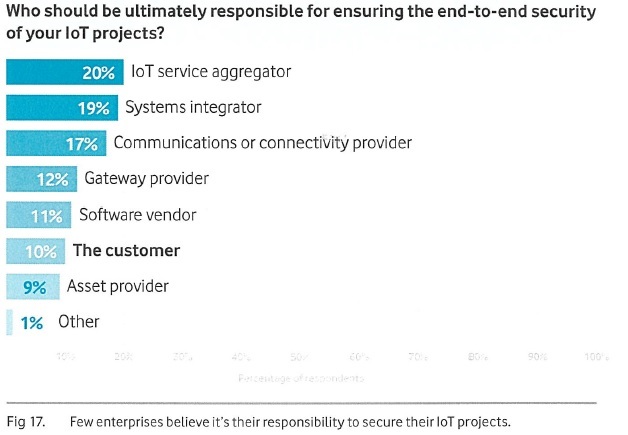 I found this very interesting graph in Vodafone's IoT Barometer report for 2016, page 31, highlighting that "Few enterprises believe it's their responsibility to secure their IoT projects"
Following on from this topic I would like to share the following IEEE article which came through my inbox. With recent attention in the media, along with the innate obligation as engineers to develop and deliver safe and secure products, cybersecurity in the IoT is a massive topic. Not only is it wide it is deep too with the landscape constantly changing as hackers adapt and find new exploits. Therefore, I thought it best to share the following article from the IEEE I read this morning on the topic. I have just read that Adelaide wants to become a smart city and has patterned up with Cisco. Now being an astute reader, you will find that this article is dated the 9th of September 2014. So beyond the free WiFi access offered by the city’s partner Internode, can I ask what tangible or measureable outcomes for the IoT, e.g. the number of IoT start-ups, such a forward and proactive initiative has generated over the past 2 years or are we yet to reach that tipping point? And what has been the impact of the “smart city” on Adelaidean’s lives, are they better off? So I've started this thread to provide a central spot for this community to share or add links to news about the rollout of IoT networks around the world. South Korean telco SK Telecom recently claimed it was rolling out the world's first nationwide Internet of Things (IoT) network, but it looks like the Netherlands has beaten it to the punch. Exclusive SigFox network operator for A/NZ, Thinxtra, has started the deployment of the live SigFox public network, with installations of antennas on top of the tallest buildings in Australia – Sydney Tower Eye and Melbourne Eureka Tower. Ingenu has announced the initial rollout of its Machine Network that will rise in Phoenix and cover 30 US cities by the end of 2016.